OK, I’ll admit it: this title is heavily (heavenly?) influenced by the previous Easter weekend – yet has no relation to it whatsoever. Or has it? Apt. Very apt. Vishal’s words tell me a tale of what’s to come for SAP, and I won’t mention the word disruptive but if SAP follows up on this, well, I might need to modify some posts. In the beginning, there was a business application. It was whole, and it ran somewhere in the bellies of an enterprise, on mainframe. It would solely rely on data entry by living human beings, aka users, and check and verify, i.e validate, the data entered before swallowing it whole and storing it onto tape or disc, becoming the Single Source of Truth (needless to say, there wasn’t an issue around sources yet, let alone truth, so that phrase didn’t exist back then, but let’s just use SSoT from now on). The main error committed during the ESB and SOA hype was the fact that Architects viewed the IT landscape from above, high-level, and judged: all this diversity ain’t good. These applications need to comply with our standards. That’s like inventing Esperanto and demanding that everyone in your club or group masters it. Just checking: how is your Esperanto? Right. The simplified version is that an ESB should facilitate, not dictate. An ESB (and the same goes for SOA, by the way) should add value to your company by doing something for your applications, and not the other way around. An Enterprise needs a professional interpreter who translates all the technical diversity back to the business uniformity, serving both business as well as applications. Applications exist in your landscape because they’re the best of the best you could buy for money, solely, or at least mostly, because of their functionality. In the ideal and perfect Enterprise Integration situation, and Lawd knows I have architected, designed, built, tested and seen countless of those, there is one backend (layer) and it contains the full business logic that the Enterprise needs. The ESB takes this syntax and translates it into a simple, uniform syntax that can carry along the full business process definitions: old-fashioned flat-file or new-ish JSON would suit fine. and I call it Adaptive Integrated Enterprise. Look at the colours, and you’ll see how each speaks its native tongue to the ESB hub, which takes care of all the nitty-gritty tech stuff, working hard as it should be. This is a mere example. 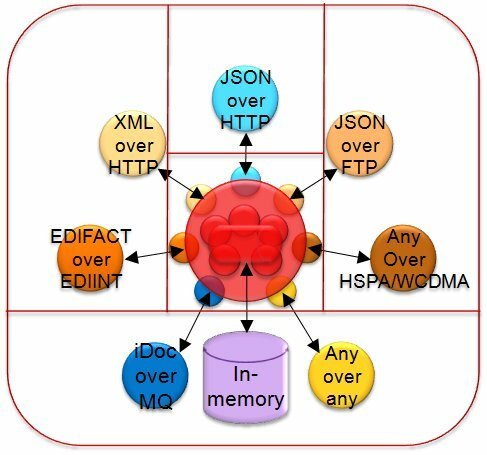 SMTP for email is missing, so is SMS, MMS, X400, X.25, JMS, industry messaging standards such as HL7, Swift, X12, and this picture is just a snapshot anyway – in 5 years it will be invalidated for at least 1/3rd. Oh my, that’s quite a bottleneck in there, isn’t it? Not only will it take quite a performance drain, but imagine how long everything will take, making it from A to B and back, through all those layers of translation! Integration middleware is a means to a goal: the goal is sustaining the business in a cost-efficient way. You don’t do that with dozens of disparate home-made geekified tech wonders: you do that with a centralised solution that stands in the middle between your world and everyone else’s, giving you full control over incoming and outgoing data- and information flow, who used what when and most, and build a BPM layer on top of that, or BI, or Big Data, or whatever you want. That does sound complicated and a lot of work, doesn’t it? Yet, it’s the smartest solution to the problem, and proven technology since decades. Performance has always been the biggest objection, and the irony of it all is that the introduction of XML as an integration syntax actually did cause an issue. 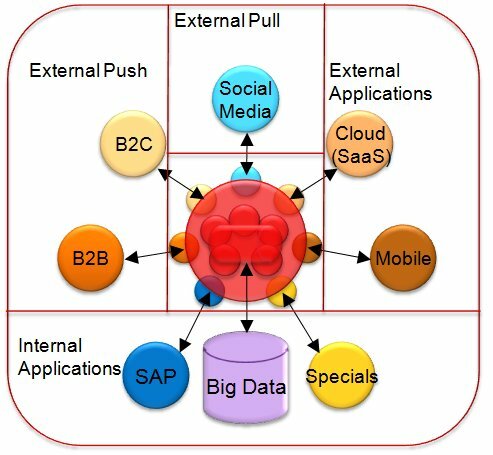 This approach will turn all of SAP into simple back-end services.